For regional offices ranging from 14 to 20,000 sf. COFFEY GROUP ARCHITECTURE, LLC* worked with corporate space guidelines and local requirements to place McDonalds into various office buildings across the nation. Each regional office is responsible for developing and managing the McDonald’s franchises in their geographic area. Locations included Denver, Philadelphia, Albany and others. We produced a comprehensive design plan for each region incorporating space for operations, real estate, advertising, data processing departments and other support tasks furnished by each territorial location. 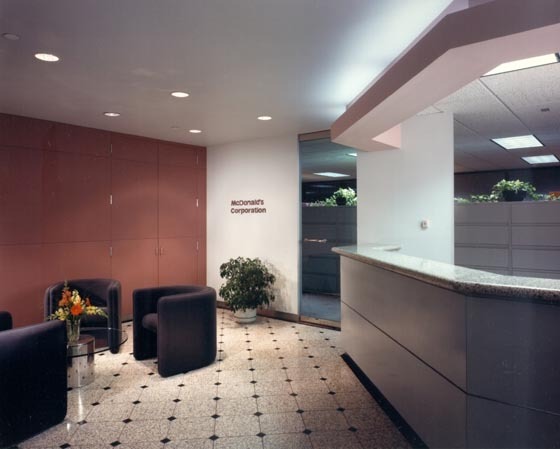 To allow flexibility and accommodate growth, movable partitions and furniture components are employed throughout with the exceptions of a set of fixed-plan elements that house reception lobby, break-room/kitchen, mailroom, storage and an audio/visual equipped employee training center.